T217278: Enable Partial Blocks on Beta: Commons, Wikisource, etc. rEUWIdba7f280feee: Localisation updates from https://translatewiki.net. rMW3f54ff5aa72c: Merge "OutputPage: Fix typo in escaped"
TBolliger moved this task from Ready to In Progress on the Anti-Harassment (Vav — ו) board. @Tchanders It appears to block partially blocked users at the stage just after they have selected the image (on beta commons). Tested various functions offered by UploadWizard with different block configs. Block shows the type of block (username, IP, IP range) and if it blocks a relevant namespace or page or if it is irrelevant to the action performed. 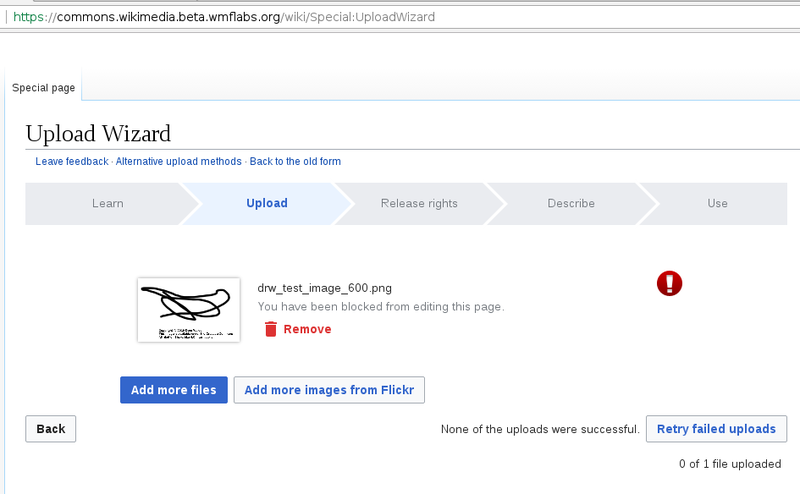 I used the visual editor in beta wikipedia to "cross-wiki" upload files to commons. The block on commons was applied appropriately. Any blocks on beta wikipedia appeared to have no affect. Not strictly related to this change, but improving coverage by looking at file moving. I could see no way to test the mass-upload user right. Turning it on and off for a user appeared to have no effect. In both cases I was able to upload more than one file at a time with Special:UploadWizard. This makes me think there is something I am missing, but I could find no documentation on this.